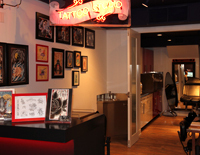 DUSK Tattoo Studio has spared no expense in creating the ultimate tattoo experience. Located inside DUSK at 552 Queen St West (Queen and Bathurst), our friendly studio is an artist-driven space with state of the art equipment and sterilization procedures that exceed government standards. DUSK Tattoo Studio is a creative hub that is home to talented resident artists and host to guest spots by hot visiting artists from across Canada and beyond. Choose from original artwork, unique flash, or create a custom tattoo. Open to everyone, from first timers to avid ink collectors, DUSK Tattoo Studio allows you to realize your body art masterpiece in the best setting you could wish for. We offer a professional environment where you can relax in comfort and confidence. Contact DUSK to book a consultation or drop in to chat with an artist and see their work.